For many building contractors one of the first areas to consider is how to start advertising your new project, that’s where our printed hoarding panels come in. 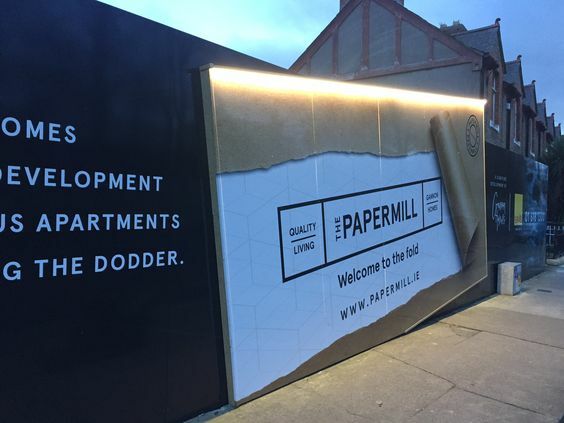 Working alongside Design Factory and Gannon Homes the team at Alexander Boyd Displays recently printed and installed hoarding panels at the new Gannon Homes Papermill Development in Clonskeagh, Dublin. They were produced with full colour printed vinyl, mounted and wrapped around the edges on .2 skin, double-sided composite sheets and finished with anti-graffiti laminate. The panels were installed with screw fixings to match the colour of the design. Alongside the main hoarding, our client was looking for a special effect and after careful consideration and research it was agreed to build a light box section. 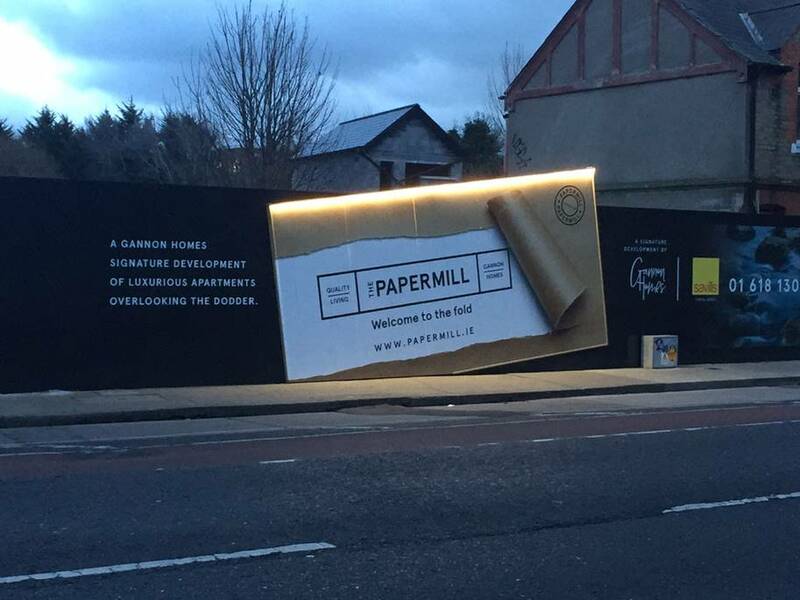 This eye catching design shows an envelope that has been torn away to reveal the development name, “The Papermill”. The box is 5.5m wide x 2.7m high and fixed at an angle over the main hoarding, it sits proud of that by 87mm thus creating a 3D style effect. The Alexander Boyd team built the box framework onsite and once in place it was finished with full colour printed composite sheets to the front and sides, maintaining the same high standard spec as the main hoarding. How do we capture the attention of those going by? We’ve illuminated the box from overhead with a custom made 5.5m long, 12 volt LED strip light. It is housed in a mini aluminium profile and fixed to the top of the box with projecting aluminium composite strip. The fitting protrudes out approximately 75mm to allow distribution of light over the graphic to create the maximum effect at night. The finished project is a striking design that captures attention and increases interest in the project, we’ve received fantastic feedback from our client who were very happy with all aspects of the job from start to finish. If you require printed hoarding or would like information on our full range of printed services, get in touch with one of the team today.